"The Best Boat Ride Ever"
The Bimini Sands Recreation & Activity Department offers tons of opportunities for fun and adventure around Bimini. Whether it's our Shark Encounters, snorkeling trips, Bimini Nature Trail tours, kayaking expeditions, island tours or other possibilities, we've got something for everyone to enjoy. For the younger adventure seekers, we even offer Kid's Club activities that both local Bahamian children and visiting guests can experience. 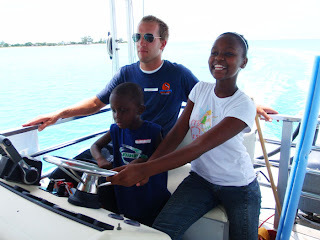 This past weekend, our Kid's Club group took part in what can only fairly be described as "the best boat ride ever." A group of about 15 children boarded the Bimini Sands pontoon tour boat for a fun and informative island tour with our Recreation Department staff. The children get to learn all about the history and environment of Bimini as we cruise around the islands, and there's always the possibility for exciting wildlife sightings... And there was plenty to see on this trip. Anxious to see some animals, the group saw everything they could have asked for including sea turtles, stingrays, blacktip sharks, spotted eagle rays, a tiger shark and even a pod of bottlenose dolphins. No matter what your age is, next time you're on Bimini make sure you check out all the possibilities this island has to offer at the Bimini Sands Recreation and Activity Center. 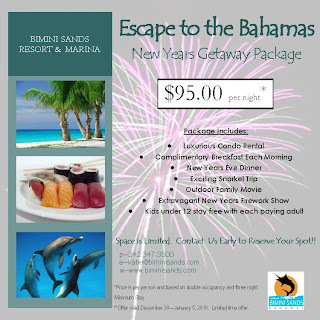 Bimini Sands New Year's Special!!! With Labor Day Weekend coming to an end, Bimini's busy summer boating season is winding down. 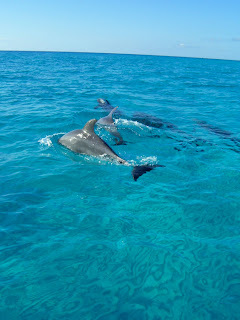 But that doesn't mean that you can't start planning your next visit to Bimini Sands today. While the summer weather makes the boating and fishing fantastic around Bimini, this little island offers big fun all year round. Whether you're looking for an adventurous getaway or a relaxing vacation, Bimini Sands has everything you need to make your visit to the Bahamas a wonderful and unforgettable experience. And with our great New Year's Special Offer, your trip to paradise is more accessible than ever. For just $95/night*, Bimini Sands is offering up a luxurious condo rental, complimentary breakfast, New Year's Eve dinner, snorkeling trip and the best fireworks show in the Bahamas. And, kids under 12 years old stay free with each paying adult. 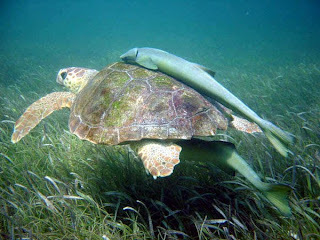 Starting today, September 1 2009, all sea turtles in the Bahamas are now fully protected by law. The Ministry of Agriculture and Marine Resources has amended the Fisheries Regulations to "prohibit the harvesting, possession, purchasing and sale of marine turtles, inclusive of their parts and eggs." All seven species of sea turtles that exist today are listed as "endangered", and five of those seven species are found throughout the Bahamas. The sea turtles that are found in the Bahamas are the Loggerhead, Green, Hawksbill, Leatherback, and Olive Ridley. Both Loggerheads and Hawksbill turtles even use the western beaches of Bimini for nesting. In passing this amendment, the Bahamas has taken a significant step forward in promoting marine conservation and we applaud all who were involved in this effort.